A fantastic Mediterranean villa with brilliant pool (10x5) and TENNIS COURT, boules terrace and table tennis, summer kitchen and built-in BBQ. Washing machine, dryer, American fridge/freezer, 2nd drinks fridge. Freesat+, HiFi and WiFi! Hugely flexible accommodation for as few as 2 to as many as 10+. Superb golf (Les Terres Blances PGA 18 hole -7km) and the Riviera coastline (15km). Local village of St. Paul en Foret is just 2km away with an excellent boucherie, epicerie and 2 great restaurants. Local market towns with many more restaurants and much to see and do close by, including riding, gliding, canoeing/kayacking. Wonderful local wines and produce make it the perfect holiday for the gastronomes! The Gorges du Verdon is under 1 hour 's drive and in the winter there's just a short drive for local skiing and only 2hrs to Isola 2000 and other premier resorts. Some of our guests just stock up and don't move because the setting is so perfect. In July 2003, we walked up the drive of Les Terrasses & my first words were... "I wish this was ours... wouldn't you die to have a place like this?" Two months later, it was ours and ten years on we have a spacious, comfortable, fun and well-equipped home. We reflect on serendipity with a warm smile and just a bit of back ache. We love it. Chris is a GP and I have a business specialising in presentation skills training. We have 4 grown-up children who, like us, enjoy lying by the pool, playing tennis and boules, sipping rosé, long lazy lunches, giggly outdoor suppers, breathtaking walks, winter skiing, fabulous golf, amazing restaurants, gorgeous markets, nearby sandy coves, Mediterranean scents, gastronomy... Knackered and thin we stagger in, happy and stout we stagger out. This area of Provence is something else... on the one hand you have the beauty of rural Var and on the other, you have the sophistication of the Cote d'Azur. From our Cambridge home, we can get door to door in about 5-6 hours. EasyJet and other carrier flights from UK airports to Nice are in abundance and it's just 45 mins to the villa from Nice airport. Our local village, St. Paul en Foret and our local town, Fayence are both very 'French' and very attractive with lots going on, in and around them. The joy of this area is that you can opt for a sophisticated day out in Mougins, Antibes or many other tourist spots, but you can then come back to the serenity and privacy of a beautiful home. Perfect. It's wonderful to have so much to do. The active ones enjoy endless games of tennis on the private tennis court and the less energetic love to lounge by the pool or sip at their drink whilst playing boules. Guests with young children thank their god for the sky package... their kids are watching TV while they have their lie in. Our guests who love to cook comment on the brilliant kitchen... they can potter away but everything else going on is still within ear shot. Those who love to madly launder (?) have everything to hand. Those who love to sample local vino enjoy the plethora of domaines within striking distance - especially Val d'Iris. From markets to mountains, it's all nearby. We're talking minutes, not hours. Funny though... many don't budge for the duration. Living room: fireplace, sofa bed seating for 12 people. Dining: dining area, child's highchair seating for 12 people. CD, stereo system, full Freeview TV package, radio, DVD. You can just make it to Gréoliere in 45 mins - but with the wind against you and a 1100cc car with 4 people and equipment, it could take 50 mins! There are a vast number of fabulous golf courses in the region, the nearest being the PGA Terre Blanche, providing magnificent facilities and outstanding views. St. Endreol is only 20 minutes away, but the local list is endless. Notes on accommodation: The house is great for all ages but as it's on a gentle hillside, there are some steps. As well as the tennis court and superb private pool, there is a boules terrace, table tennis and there are some board games. The freeview tv package is mainly for UK channels. We even provide you with extra DVDs to watch and there is a large selection of mini disks for all music tastes. There is a fantastic outside summer kitchen with a BBQ. This is wonderful on extra hot days and warm evenings and we manage to fit about 18 people around the table. Other table and seating arrangements are flexible and should work for all guest groups. WiFi in main house. Outside: Private heated 10m x 5m swimming pool, petanque ground, table tennis, outside kitchen,terraces, private parking, private tennis court, barbecue, children's swings, large garden, 10 poolside sunbeds, clothes whirlygig. Utility Room: Washing machine, tumble dryer and extra drinks fridge. Cleaning / Towels / Linen / Maid service: Linen and house towels are provided for up to 10 people. Beyond that, we ask people to please bring their own. The house is cleaned for arrival and on departure, but there is no maid service during your stay. You will however see pool maintenance staff. Other: Summer Kitchen attached to back of house with BBQ. Wonderfully relaxed and cool area on hot summers days and evenings. We had a happy stay with another family for a week in late August. Slightly ashamed to say we didn't venture out further than Fayence and Mons as there was too much fun to be had at the house. Many different sitting areas were appreciated for their shade and sun with card games on one side of the house and post A level careers advice over several bottles of wine on the other! Fantastic barbecue and a kitchen that was equipped with enough of everything; the extra booze fridge was very welcome... Extras such as super comfy pool lounger mattresses, electric awning over main outside table, enormous and versatile umbrella for shade by the pool meant that it was always possible to create your perfect spot! Another big plus was the beds which were very, very comfortable which is not something that I have often said of a holiday house. All in all a lovely, happy week in the sun in a house that felt like a home from home. Thank you very much Lucy and Chris. Thank you so much for this lovely review - we really appreciate your kind words. We had extra thick sun lounger mattresses specially made and we agree... it makes all the difference! Chris and I are foodies, so we wanted to make sure that others who are like-minded have everything they need to knock up their gastronomic creations! You noticed the beds... thank you! I know it was pretty warm when you were there, so we're glad you were able to make the most of the shady areas. Thank you again for taking the trouble to write the review Janie - we're so pleased you had a great time. Fabulous property for unwinding. The terraces allow everyone their own sunbathing space and shade too, if needed. There are many areas to eat depending on mood, the terrace with the stunning view or the outdoor kitchen in the shade. For us the sheer tranquility, options for sporting activities, large pool and numerous relaxing spaces made this an absolute winner. We don't usually holiday in the same place more than once, but think we could make an exception for this wonderful home. My husband and i have stayed at Les Terrasses a few times and it never ceases to leave us with the feeling we've been somewhere really special! Each time we've been we have shared the place with friends and inside the peaceful surroundings we've been able to enjoy fun days around the pool and tennis court, lunches on the sunny deck and BBQ's in the courtyard in the evenings. I enjoy cooking and entertaining and the Kitchen/Dining area is perfect. Plenty of space indoors and outdoors and only a 40 minute drive to the Coast if You fancy a day out. I will continue to return from whatever part of the World we are in. This is a great house in a lovely peaceful location. It has a fantastically well equipped kitchen with all the utensils and crockery you could possibly need. There are some excellent restaurants in the area too. The swimming pool is lovely and large, enabling serious swimming to offset those calories piled on during long, lazy lunches on the terrace. A fantastic place to unwind. I am going to be honest and declare an interest ! Lucy is my sister, but I just wanted to say that she and her husband Chris are lovely , fair and honest people who own a fabulous place and would be devastated if they thought any guests were not absolutely delighted with their choice of holiday location in terms of peace and quiet, facilities and quality of accommodation. You won';t regret it. We can provide tuition in photography, public speaking, professional selling, employment law and memory improvement. We can also create a full bespoke holiday itinerary for you, according to your aspirations. This would be organised and guided by Lucy and Chris Clayton-Payne. Lovely Riviera beaches at 18 kilometres. 2km to St. Paul en Foret. 7km to Bagnols en Foret. Inland Riviera - just 30 minutes into the foothills and within a few minutes of national parks. Local market town Fayence is close to Grasse, Mougins, Draguignan and an easy trip to St. Tropez. House and grounds are set in natural pine parkland and vineyards 2km from local village. Secluded yet not too remote - 5k to a huge LeClerc! Wonderful local market towns and surrounded by exquisite scenery. 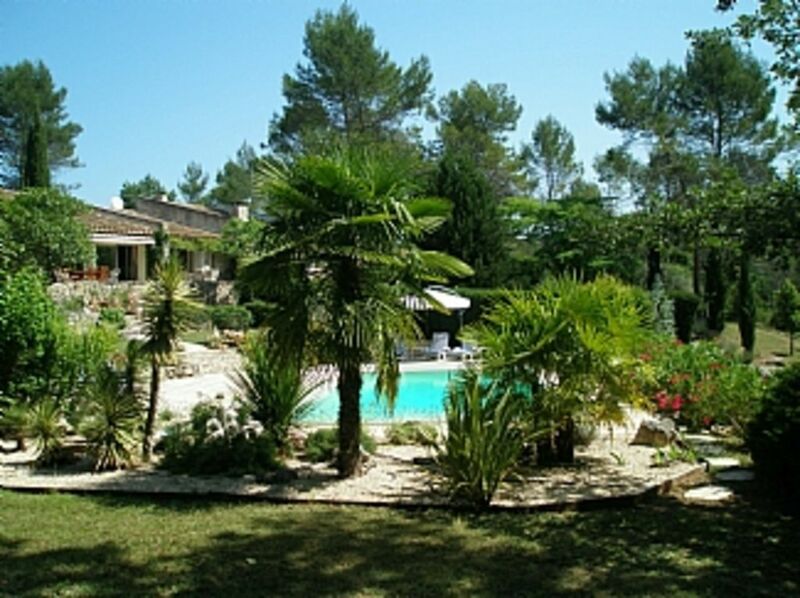 Close to Lac St. Cassien for windsurfing and only 15km from nearest beaches. Amazing PGA golf course (Terre Blanche) 7km away. Excellent for walking, biking, riding, gliding and touring. Skiing just 45 min. Booking Notes: 30% deposit to secure booking - remainder payable 6 weeks prior to departure. £600 damage deposit - returned within one week of departure, following inspection. Changeover Day: High season changeover is Saturday - arrival 4pm, departure 10am. Outside high season we like to be as flexible as possible and will consider long weekends and longer term rentals. Notes on prices: Priced for an average of 6-8 people, happy to discuss price for short notice bookings and smaller numbers.